Speaker: Omar Ishrak, Chairman and Chief Executive Officer, Medtronic Inc.
With more than 50,000 employees, Medtronic operates in 140 countries, $17 billion in revenue, delivering medical products to more than 10 million people each year. Innovation must continue while delivering effective products at lower cost. The challenge of developing medical devices for the more than 4 billion people who today have no access to care is immediate. The incorporation of low power and flexible microelectronics into implantable medical devices has substantially broadened applications for these devices while allowing for less invasive delivery and reduced complications. Cardiac pacemakers have been reduced in dimension by magnitudes; the potential to deliver a wafer scale pacemaker will soon be realized. Implantable and wearable physiologic sensors will facilitate remote management of the devices and the patients who use them. Convergence of information and communication technologies into medical devices will catalyze Medtronic's vision to distribute health care to billions of patients who have minimal access to affordable care. Chronic diseases such as heart failure, diabetes and hypertension can be better managed with implanted and wearable microelectronics and adaptive closed loop algorithms. It all starts with imagination and engineers. 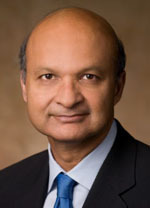 Omar Ishrak has served as Chairman and Chief Executive Officer of Medtronic since June 2011. Medtronic is the world’s leading medical technology company, with more than $17 billion in annual revenue, and operations reaching more than 140 countries worldwide. Medtronic provides therapies that are used to treat a wide range of conditions, including cardiac and vascular diseases, diabetes, neurological and spinal conditions, and more. The Medtronic Mission is to alleviate pain, restore health, and extend life for millions of people around the world. Omar joined Medtronic from General Electric Company, where he spent 16 years, most recently as President and CEO of GE Healthcare Systems, a $12 billion division of GE Healthcare, with a broad portfolio of diagnostic, imaging, patient monitoring and life support systems. Omar also served as an Officer and a Senior Vice President of GE. Earlier in his career, Omar amassed 13 years of technology development and business management experience, holding leadership positions at Diasonics/Vingmed, and various product development and engineering positions at Philips Ultrasound. He grew up in Bangladesh, earned a BS and PhD in Electrical Engineering from the University of London, King's College. Omar is a member of the Board of Trustees of the Asia Society and is also on the Health Leadership Council of the Save the Children Foundation.